Handheld circular saws can be vicious beasts for cutting joists on-site or relatively civilised ones for interior joiners - the Metabo KS66 Plus is definitely one of the latter. 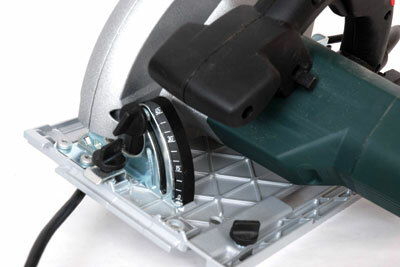 If used with the Metabo guide rail it is capable of the sort of accuracy that is needed in a workshop. I had been working on an oak chest and needed to trim the top exactly square and accurately. Using the guide rail supplied for the test, I managed perfect results. The motor is as quiet as a handheld circular saw motor can be, and felt powerful and capable. The fine TCT 14 tooth saw blade gave a smooth finish too. The dust port swivels to follow saw movement and is a standard size for most vac extractors, which makes it easy to connect and therefore more likely to be used. 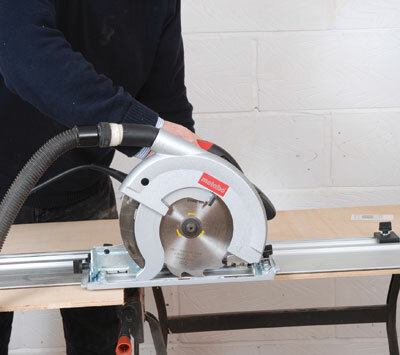 The blade angle and depth of cut adjustments on the saw are positive with large enough handles to tighten and loosen easily. A generous loop handle with rubberised grip holds the trigger and safety switch arrangement, whilst the front handle is large and well placed for easy handling. Supplied is a parallel guide fence with two rails to fix to the base - this is better than most other guide fences as it is more secure. The guide rail is wide and sits stably on the workpiece, and has two stops that can be set into a slot in front of and behind the saw, allowing it to be used for accurate plunge cutting. 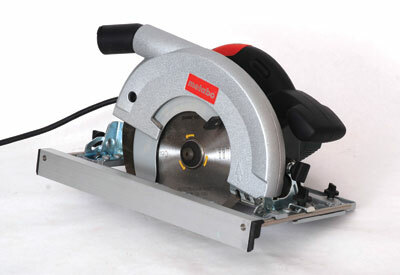 The saw is a model of German precision with good smooth handling, just enough weight and more than adequate power. It's a good 'un. "The saw is a model of German precision"